This is the old entrance to the village from the north, the original kiosk that sold postcards and informational books can be seen on the right of the Souviens Toi notice ("Souviens Toi" in French literally means "Remember!"). The gateway just visible to the left of view was for road access to the ruins. Through the grill in the doorway can be seen the house belonging to the Dagoury family (Cement manufacturers). 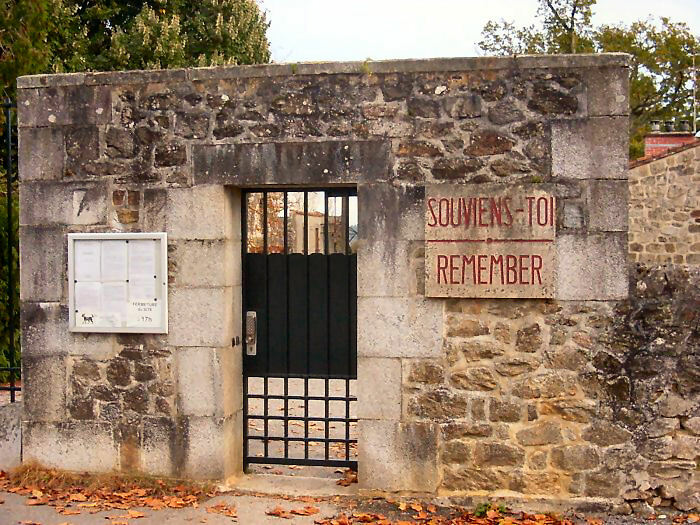 Since the Centre de la Mémoire opened in 1999, this entrance and the other at the southern end of the village have been closed and the main access to the ruins today is via the Centre (it is possible to enter via the cemetery, but most new visitors would not be aware of this route). For a close-up of the Souviens-Toi : Remember! notice, click here.